Home » Connectivity » Econet announces free access to Twitter, your move Telecel? 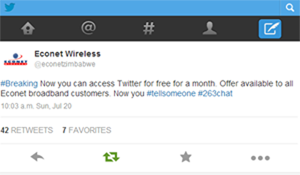 Econet announces free access to Twitter, your move Telecel? 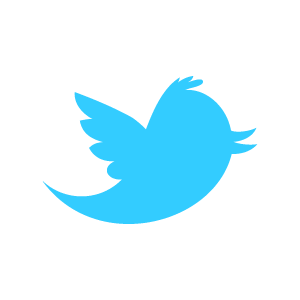 Econet Wireless announced that they will be giving all broadband subscribers free access to micro blogging site Twitter. With a tweet carrying an amusing jibe at Telecel’s catch phrase #tellsomeone, Econet has highlighted that this freebie will only last for one month. This is a welcome development for the Zimbabwean Twitter community aka #Twimbos. Expectations for a Twitter promotion of sorts from Econet have been high since March this year when the network started a campaign, called #Twimurenga on their Twitter account asking followers for 1000 retweets if they wanted Econet Twitter bundles. The Twitter Bundles were meant to follow the popular Facebook and WhatsApp bundles which have been hugely successful. According to the responses given by Econet on Twitter the free access extends to any Econet Broadband user who accesses their Twitter account through the Twitter mobile app or web interface. While Econet has gone a step further to zero rate Twitter access, the “one month only” tag is a bit of downer here. On one hand it seems Econet wants to first gauge the market’s interest in Twitter, which has failed to gain as much popularity as Facebook and IM platform WhatsApp. This promotion is likely to be extended if there’s a huge response to free access which warrants further Twitter specific products. On the other hand Econet seems to be keen to stay one step ahead of Telecel. When the #tellsomeone team launched their slightly cheaper WhatsApp bundles they mentioned plans to introduce Twitter bundles. This “limited Twitter offer” at least guarantees Econet a first mover’s advantage with another broadband product. While the exhausting battle in voice revenue rages on, the next domain to establish dominance is mobile broadband. Between Facebook and WhatsApp bundles, zero rated Facebook and #Twimurengas, the operators (whither NetOne’s response one wonders) should come up with really great deals to get their subscribers’ loyalty and money. I personally hope one of these operators comes up with a bundle or promo that escalates competitiveness in broadband pricing to a whole other level. Just imagine how YouTube bundles would change the game. Or better yet, cheaper mobile broadband packages? That would be something to #telleveryone about. half a loaf is better than nothing! Good going Econet..